Justice for her father’s murder comes at a high price, or so Felicity discovers as the hunter becomes the hunted. With pursuit on her trail, she can’t return home. Help comes from an unlikely source, as well as a new name. Dogged by tragedy, she flees west only to go from frying pan to fire. 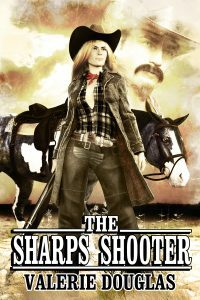 For Ty Parker, a Pinkerton Detective undercover as a stagecoach driver, Felicity’s skill with a Sharps is a godsend if he and his passengers are to have any chance of surviving the vicious gang he was hunting. Valerie Douglas has written over 20 novels that reflect her eclectic tastes. A fan of almost every genre, fantasy, mystery, thrillers, and romance. She writes books for adults with rich character and plot-driven stories. She’s companion to two dogs, four cats, and an African clawed frog who thinks teasing the cats from the safety of his tank is great fun.